You have been bored with your crazy nine to five schedule and you are now contemplating to starting your own business where you can be your own boss and enjoy more time with your family and close ones. You have a few options in mind to start with but who would finance your business? Do you have enough economic strength to kick-start your new profession or will you have to seek help from your friends and family? Establishing an enterprise is not quite easy and with lack of finds, your entire endeavour may sink in deep blue sea. In most cases, it is seen that the small as well as medium scale business owners in India are stuck at the middle of the road due to lack of availability of funds and lack of knowledge about various business loan schemes offered by government of India in proper time and in affordable rate of interest. To add to one’s dismay, finding a collateral security or a guarantee becomes a difficult thing. Plus, there are several factors like strict policies, merciless regulatory framework and weakness of the managing institutions and deficiency of right kind of credit information. But there is good news for you! 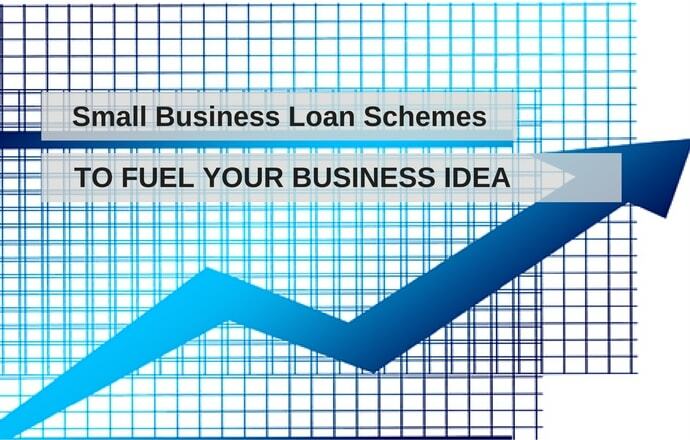 You can avail business loans offered by the Government of India to support the small and medium scale businesses. This kind of businesses form the backbone of our economy as a result of which the governing authorities have devised various plans to help the business grow by availing small business loans in india. These loan schemes would be adequate to fund for your day to day requirements and both state and central government have come together to make this venture successful. Even a few public sector banks including State Bank of India, Canara Bank, Bank of Baroda, Andhra Bank and Allahabad Bank offer suitable financial schemes for the small business owners. Each of these schemes aids the business owners to obtain financial products as well as services as per the requirements and preferences of the enterprise. Here are a few government authorized loan schemes for small scale businesses in India. The Government of India had launched the Credit Guarantee Fund for Micro and Small Enterprises for providing the collateral-free credit to the new and existing business across the country. In order to implement the scheme the Ministry of Micro, Small and Medium Enterprises in joint collaboration with the Small Industries Development Bank of India has established a trust named Credit Guarantee Fund Trust for Micro and Small Enterprises for implementing the scheme. You can fetch credit facilities either through term loans or working capital for an amount up to 100 lakh INR for each borrowing unit. 80 percent of the amount you choose to borrow would be contributed by the government and the rest 20 percent shall be given by SIDBI. This scheme can also be beneficial if you need rehabilitation assistance for your business when it is covered under guarantee scheme. Eligibility criteria: You just have to be an active member of the trust in order to apply for the loans and see your business take a new step forward with the aid. But remember that if you are facilitated to receive any collateral security or any third party guarantee, then it will be disqualified under this scheme. Visit here for more information. In order to remain competent in the turbulently competitive market any small or medium scale business owner would have to upgrade the procedures, techniques and machineries involved in the production so that the cost of production is kept under control and optimum revenue is generated. The Ministry of Small Scale Industries has come forward to help such business compete at a global level and have rolled out a scheme where the technology involved in the business can be upgraded. Known by the name of Credit Linked Capital Subsidy Scheme, this technology upgradation facility was launched by the Government to offer an upfront capital subsidy of up to 15 percent when the total amount is not crossing 15 lakhs INR. The small scale enterprises can avail the credit amount to upgrade and modernize the production machineries and technologies. You can apply for the loan regardless of whether you are running your business on a sole proprietorship, cooperative or partnership, privately or publically. The scheme was launched in 2000 and revised in 2005 and as of 2016, over 28,287 enterprises have availed a total subsidy of 1619.32 crore INR. MUDRA is the acronym for Micro Units Development and Refinance Agency Ltd and was established by the Government of India to develop and refinance the small and units across the country. It started with the motto of “Funding the Unfunded” and has immensely helped the under-privileged business owners of small organizations, startups and to start and advance their enterprising ventures by providing business loan in India. Shishu– This scheme is just for the startups who are in search for funds can avail a credit amount of up to 50,000 INR. Kishor– Those businesses that have already been started yet couldn’t establish well can opt for this scheme and avail a credit amount ranging from 50,000 to 5 lakhs INR. Tarun- Any small business that could establish itself and yet looking for means of growth can avail the scheme where can get a loan of amount ranging between 5 to 10 lakhs INR. If you are a resident of the country and willing to start an enterprise in any non-farming sector to manufacture, trade and process items to be consumed by users, you may apply for the loan by approaching any public or private sector bank, NBFC or MFI in order to avail the MUDRA loans. But it is worthy to note here that the MUDRA bank is not a separate entity like any other bank operating in the country; it is simply a financing scheme for which you have to appeal to any of the banks. You will not need to pay any collateral security amount or processing fee for availing the loan. It has been over 25 years that the Small Industries Development Bank of India or SIDBI has started their credit program by an act of Parliament. Today this institution is one of the most popular names among the government financial organizations as it plays an active role for promoting as well as developing the small business industry. Some of the most important schemes offered by the Small Industries Development Bank of India include: Indirect Assistance Scheme, Direct Assistance Scheme, Promotional & Development Activities, National Equity Scheme & Fund, Technology Development &Modernisation Fund Scheme, MahilaUdyamNidhi, Single Window Scheme, Scheme & Equipment Finance Scheme, Integrated Development of Leather Sector Scheme, FPTUFS: a scheme for Food Processing Enterprises. One of the top 30 development banks across the planet, SIDBI is directed towards helping the first generation entrepreneurs to make them strong and competitive. The eligibility criteria to apply for credits vary on the basis of which scheme you are willing to apply and therefore you are requested to surf through the official webpage of SIDBI to know more about their various loans and services. In 1999 the National Small Industries Corporation Limited or NSIC was established to encourage the small scale businesses in India. The primary aim of the NSIC is to assist the entrepreneurs to import machineries and equipmentsfor hiring or purchasing and also helps for the supply and distribution of both native as well as imported products to improve the productivity and effectiveness of the business. Plus, the National Small Industries Corporation Limited also educate the business owners on the advancements that are constantly taking place in the field of small and medium scale businesses. The delegates of this organization have been visiting the developed countries such as Germany, Japan, Italy, Mexico, Brazil, USA and Canada from time to time to take an active part in the advancements taking place in all these countries so that they can inculcate the education and knowledge among rising Indian entrepreneurs as well. The Market Development Assistance Scheme is known for aiding the small and medium enterprises to exercise a good hold on the international market. It offers credits to the business owners who are willing to participate in the international trade fairs or the industrial exhibition representing the MSME of India. The Market Development Assistance Scheme is also highly popular for offering funds to the sector particular market studies, export promotions and FIEO. This scheme is favoured as it offers a 75 percent reimbursement of a one-time fee for registration as well as 75 percent reimbursement of recurring annual fee that has to be paid to the GSI for the initial 3 years for the barcode. What’s more NABARD has also launched a specifically crafted credit scheme to meet the energy security hurdles in our country. It is directed in making India one of the acknowledged names in the field of renewable energy resources and is willing to assist all entrepreneurs who are planning to take this project forward. The Government of India also offers financial assistance in the arrangement of grant in aid for a single time for assisting the state governments in setting up Mini Tools Room and Training Centres. The financial assistance can cover up to 90 percent of the total cost of equipment and machineries for up to 9 crores and in case of upgradation of existing room 75 percent of the cost can be fetched amounting to a maximum of 7.5 crores. The primary goal of this venture is to arrange for as many tools rooms as possible so that the small and medium scale business owners can avail technological support and training opportunities for the designing and manufacturing of tools and help towards facilitating a workforce of trained and educated designers, engineers, supervisors and skilled workers. This is yet another venture aimed at training the small and medium scale industries so that they can utilize more energy effective ideas and procedures in an effort to minimize the cost of production as well as control the emission of harmful and toxic waste materials to the environment. The Technology and Quality Upgradation Support is also aimed at improving the quality of production and encourage the small and medium scale industries to be globally competent. In most cases, it is seen that the business owners have to face different types of obstacles to upgrade the technology and quality of various things involved in their business and this scheme is hugely beneficial as it offers credit for the cash intensive requirements. You may apply the enlisted government sector banks for availing this scheme for the sanction of the loan and boost the manufacturing units of your micro, small or medium scale business. If you are an entrepreneur or want to be an entrepreneur then their is various business loan schemes available to help your business to grow. Business loan schemes are offered by government of India to help indivisuals grow in their respection field and to take part in growing economy of India. You should must take this opportunity and avail the benefits of business loan schemes in India. But Can you also suggest something profitable. Could you please suggest any “CONSULTANT” to guide & Help me getting loan. I will be really very Greatful to you.